This post was written by Hector Stinton, a third-year Spanish & French student at Keble College. As an undergraduate reading French and Spanish, I have chosen to spend my year abroad working in Santiago de Chile (August 2017 – June 2018) and Paris (July – September 2018) as a British Council English teacher and Assistant Film Producer, respectively. In the summer before starting the Spanish half of my year, I set myself three main objectives: to enhance my understanding of Hispanic culture, to improve my Spanish, and to challenge myself professionally. Being embedded in life and work in Chile has given me great insight into Latin culture. For example, in England, flying or wearing our flag is uncommon and has nationalistic associations, even on St George’s Day; whereas in Chile, La Estrella solitaria is seen far more frequently, especially on Independence Day in September. Dig a little deeper, however, and you find that it is still a legal obligation, though rarely enforced, to fly a flag from every house or tower block – a hangover in the constitution written by Pinochet, demonstrating his pervasive legacy. At the other end of the spectrum, and typifying the wry sense of humour, the beverage of choice – a litre of sweet fermented wine with pineapple ice-cream – is called a terremoto (‘earthquake’), despite the fact that tremors regularly raze towns and villages, and have left the capital without any pre-modern architecture. It is said that if you can speak Castilian in Chile, you can speak it anywhere in the world, since Chilean Spanish has a fearsome reputation for its thick accent, fast delivery, and plethora of peculiar idioms and neologisms, known as chilenismos. Separated from Peru and Bolivia by the Atacama Desert to the north, from Argentina by the Andes to the east, and surrounded by ocean to the south and west, Chile’s geography has seen its language develop hermetically. Even when Chile became more accessible, wars with her neighbours, and continuing mutual suspicion, have made the distinct speech a point of national pride. For this reason, Chilean vocabulary has been particularly enriched by its immigrant and native communities: ya (‘yeah’) from the German ja, ¿cachai? (‘you know?’) from the English ‘to catch one’s drift’, cancha (‘field’) from the Quechua kancha. The grammar, too, prefers the Italian ai or ei ending to the Iberian as or es when using the informal tu form in the present tense, and rejects completely the peninsular vosotros ‘you plural’. Acquiring all these subtleties, and many more besides, has made me a more complete linguist. 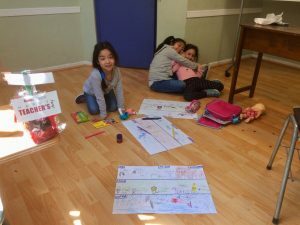 Professionally, working at the biggest language school in Santiago, the Instituto Chileno-Británico de Cultura, has presented its own set of challenges. On Friday evenings, I teach an advanced one-on-one student who happens to be the philosophy chair at the top university, and is preparing to deliver a series of lectures at Yale. A few hours later, on Saturday mornings, I go from feeling more like a tutorial student with the aforementioned academic, to helping a class of six-year-old girls colour and annotate big A3 sheets with titles like ‘My Zoo’ and ‘My Favourite Food’. ‘Variety’ is certainly the watchword at the ICBC, because every day I engage with and adapt to a huge range of different ages, backgrounds and abilities.